The Rebel Sweetheart. : ANNIVERSARY GIVEAWAY! | Win a Cetaphil® Prize Pack! ANNIVERSARY GIVEAWAY! 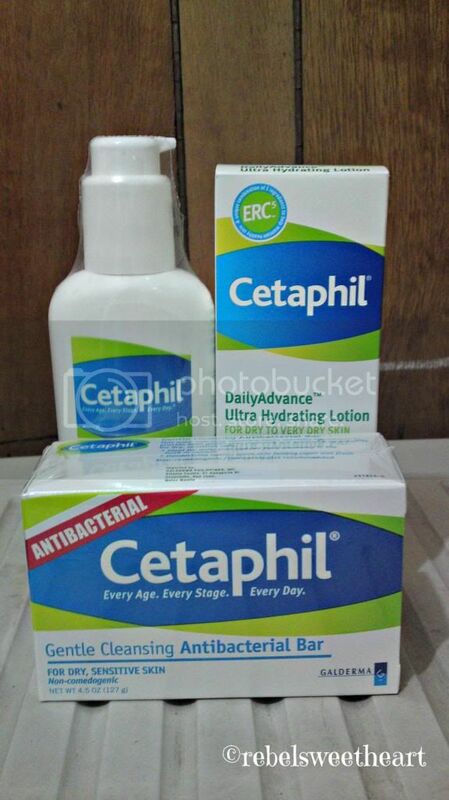 | Win a Cetaphil® Prize Pack! A facial moisturizer plus moderate sun protection, all in one. Cetaphil® Daily Facial Moisturizer SPF 15 is specially formulated to be effective, light and silky-smooth — ideal for facial use. In addition to providing gentle moisturization for all skin types, Cetaphil® Daily Facial Moisturizer SPF 15 gives you moderate protection against damaging UVA and UVB rays that are responsible for premature lines and wrinkles. This skin moisturizer is lightweight, fragrance-free and suitable for use under makeup or after shaving. Clinically proven to protect dry skin for 24 hours. Designed with a unique combination of five key ingredients, Cetaphil® DailyAdvance Ultra Hydrating Lotion® is clinically proven to hydrate for 24 hours. The moisturizing formula is fast-acting, long-lasting, and helps moisturize extra dry skin. Non-greasy, non-irritating, non-comedogenic and fragrance-free, Cetaphil® DailyAdvance Ultra Hydrating Lotion® is an ideal full body moisturizer. An effective cleanser that removes surface bacteria and oils. Cetaphil® Antibacterial Gentle Cleansing Bar offers effective cleansing for dry, sensitive skin with the added advantage of antibacterial activity. This cleansing Cetaphil® antibacterial bar provides your skin with unique, dual-action moisturizing and deodorant benefits in a mild, non-soap formulation for all-over body cleansing. As always, there's a Rafflecopter below waiting for your entries. until December 15 (midnight EST). Happy Anniversary to The Rebel Sweetheart! Happy anniversary and more years to come ..
Congrats on your blog anniversary. I've also been using Cetaphil on my face as it tends to get sensitive. Been a cetaphil user for years now. Its really good for sensitive skin. I like the moisturizer very much! id love to try the moisturizer! Been trying Cetaphil gentle cleanser. from thhe description itself, i love its gentle touch to me and my baby. Looking forward to try Cetaphil Daily advance ultra hydrating lotion. I would like to try their oil control foam wash because I have an acne-prone skin. I've been using Cetaphil Gentle facial cleanser and that's my fave til now.